I started studying equine nutrition in 1994 while I was managing a farm store for an absentee owner, as horses have always been a passion of mine. After 7 years I left there and perused other interests for a year before opening my own store, Amy's Animals in 2002. Upon my husband Rich’s retirement, he came to join me in the store. Even though I grew up with dogs, as an adult I only had cats, until I got my first boxer, Roxanne in 2003. She came to me with some medical issues which were misdiagnosed by many different conventional veterinarians. I decided to seek out a holistic veterinarian and after seeing the amazing improvement in Roxanne, my passion for research and understanding in alternative veterinary modalities was born. Since then I’ve attended many lectures on nutrition. 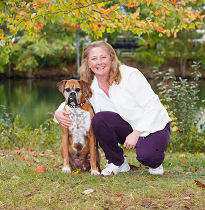 I’ve become an academic member of the American Holistic Veterinary Medical Association. I’ve had the honored opportunity to be a lecturer at two of their annual conferences, in Covington Kentucky in 2010 and in Birmingham Alabama in 2012. I continue to attend as many lectures and seminars as possible to build my knowledge in canine & feline nutrition and wellness. I lost Roxanne in 2013 but I will always be grateful to her for being the muse that inspired the course of my career. My mission in life is to educate people about correct nutrition & wellness so they can keep their pets as healthy as possible. 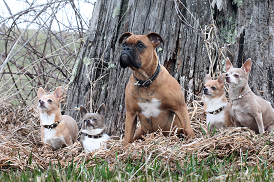 I have 5 dogs including one boxer, 4 chihuahuas and 2 horses. They are the highlight of my days. I find there is no need for television in my house! They enjoy hiking with me and also “help” in the vegetable garden! They have learned to pick their own string beans and raspberries, which I don’t mind as long as they leave some for me! There have been many changes in the pet food industry since I began so long ago in 1994. Pets are now considered part of the family. Since people are becoming more educated about their own health and foods they choose to feed their families, they are also becoming more educated about what they are feeding their pets. This has led to the consumer driven changes we see today. Grain free diets and raw frozen diets are becoming more popular as people realize that the food available in the grocery stores are laden with ingredients that are unsuitable for human consumption and should be labelled as such for their pets. The humanization of pets has changed the products the pet food manufacturers have to offer if they expect to stay in a profitable business in the future. It will be very interesting to see the paradigm shift over the next 5 years.